Online grocery sales are expected to increase over the next six years, and as a result, shift demand for cold storage from retail space to industrial space in warehouses and distribution centers, according to real estate firm CBRE. Online grocery sales currently constitute 3% of all grocery sales, but are expected to rise to 13% by 2024. According to the press release emailed to Supply Chain Dive, cold storage accounts for 180 million square feet of industrial space (to be delivered to homes) and 300 million square feet of retail space (to be sold in traditional brick-and-mortar stores). CBRE expects 35 million square feet of cold storage to shift from retail to industrial by 2024. Industrial food-commodity and retail cold storage will shift as online grocery sales increase. It's no secret grocers and meal kit services that sell online and deliver to homes struggle with the cold chain, but it's a chicken-before-the-egg conundrum — if they can improve customer satisfaction enough to generate a demand spike, then they could invest more in their cold chains; but until they invest more in their cold chains, they will continue to struggle with delivering high quality, non-spoiled food to customers. If grocers, meal kit services and online retailers dipping into the grocery space (see: Amazon) can figure out how to convince consumers that buying groceries online is a good idea, then CBRE's prediction just might be correct. Unfortunately, winning consumers over to online grocery shopping might have gotten more difficult after various meal kit services — like HelloFresh and Blue Apron — have scared away customers by delivering spoiled or inedible food, or failing to include all the correct ingredients in a shipment. These are common complaints from customers, according to Consumer Affairs reviews. Walmart is already brainstorming ways to fix the consumer trust problem. The retail and e-commerce giant has a patent to allow consumers to view real-time photos of groceries they're thinking of buying online. The store is clearly banking on consumers getting on board, because it's expanding online grocery delivery to 100 cities. Online grocery is expected to grow, even if it doesn't become the preferred way to shop, likely why CBRE expects the demand for cold storage space to shift a bit from retail to industrial. For now, retail space will remain the primary provider of cold storage space, but if industrial warehouses and 3PLs can manage cold storage of perishable products better than the average retailer, then that could spark a greater consumer shift toward buying groceries online. 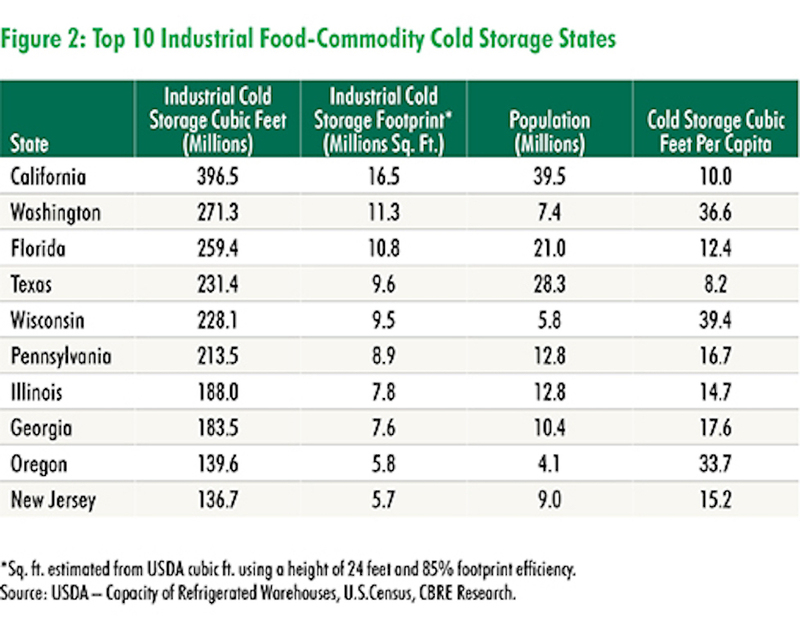 CBRE Cold Storage: About to heat up?